Sites that offer coupons and deals online are very popular. Running a coupon website involves listing coupons and sales; you make money from paid advertisements on your site and from commissions earned when people click on the coupons. A coupon website is a great way to make extra income, especially if your hobby is shopping and finding deals online. It doesn't cost much to set up, and promoting it is easy with online marketing and social networking. The market for finding general coupons and deals online is somewhat saturated with big names like Fat Wallet and Groupon, so competition is fierce. However, a specialty website or coupon blog that offers deals in specific areas is a good alternative that can make extra income. Research what your target customers buy to figure out how to start a coupon website with relevant deals and low competition. The site must be attractive and easy to use, with search capabilities for users to find the coupons and deals online that they are looking for. It should have social networking features like blogs, chat and forums for users to interact with each other. Consider purchasing a customizable template or hiring a website designer. If you choose to start small with a blog, it's easy to create a free blog with WordPress or Blogger. Since you're reading this article, it's likely that you've already visited at least several coupon sites. If not, to get an idea about how a coupon website should look and what features it has, search Google for "coupons" and visit some of the sites returned in the results. Usually your web hosting company will do this for you. Remember to renew your registration annually or when it's ready to expire. You can save some money by registering for longer periods of time once you know the site is successful. Register your website with Google, Yahoo and other search engines. 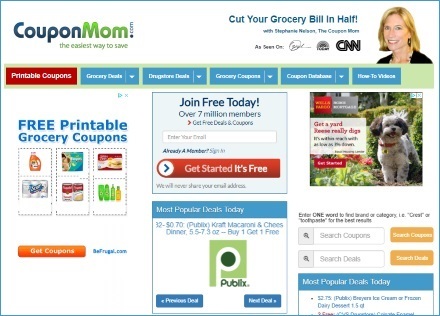 Find Coupons to Place on Your Blog or Website. Contact local and national businesses to get coupons. Some offer programs that give you a commission on sales when people use coupons from your site. Another idea is to rent advertising space on your site where retailers can place coupons. Do some work yourself by looking for online deals and coupon codes, and then placing them in your blog or site. Be sure to have a way for users to easily share coupons and online deals on your site. Consider Registering for Affiliate Programs and Coupon feeds like FMTC and Smash Deals. There is a fee for this subscription, but it's a way to get large numbers of coupons without doing a lot of work. Market Your Site with Social Networking and Search Engine Optimization Techniques. Create Facebook and Twitter accounts to broadcast online deals as you hear about them, with status updates that direct back to your website. Use keywords when writing articles or blog posts so that people looking for deals will find your site. Make sure your schedule allows for finding deals online, engaging in advertising and social networking tasks and maintaining your site. Keep your site up to date; remove coupons or deals as they expire.